This decorative loop uncut chainette fringe is the perfect finishing detail for performance costumes and dance outfits. The total overall length is 2", which includes the attached decorative header. The actual looped rayon fringe part of this trim is about 1 1/2" long. This looped chainette fringe is available in 4 colors. White, Red, Royal and Black. 2" Long Silky Rayon Chainette Fringe Trim in 50 Colors. $2.95 per yard in 34 Solid Chainette Colors. $4.90 per yard in 3 Fluorescent Chainette Colors. $4.90 per yard in 13 Metallic Fringe Colors. 11 lengths available, from 2" to 36" long. 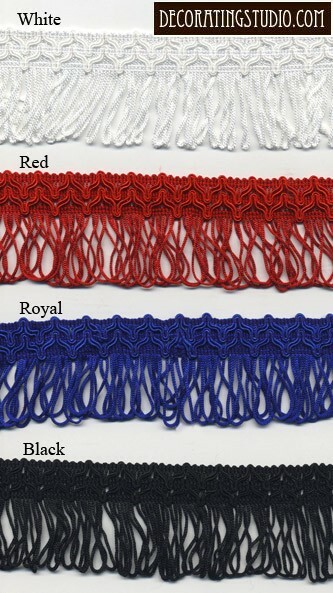 3" Long Rayon Chainette Fringe Trim in 37 Colors. $4.45 per yard in 34 Solid Chainette Colors. $6.80 per yard in 3 Fluorescent Chainette Colors. 11 lengths available, from 2" to 36" long. 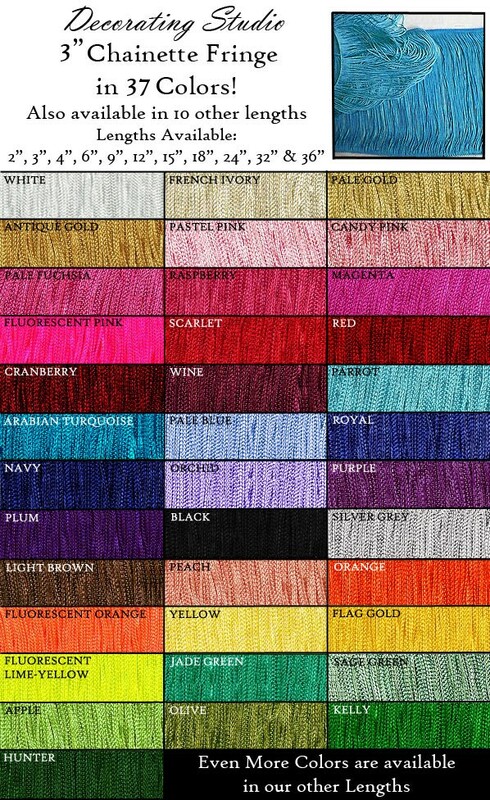 12" Long Silky Rayon Chainette Fringe & Sequin Chainette Fringe in 63 Colors. 11 lengths available, from 2" to 36" long. 9" Long Silky Rayon Chainette Trim in 50 Colors. $13.75 per yard in 34 Solid Chainette Trim Colors. $19.75 per yard in 3 Fluorescent Chainette Trim Colors. $27.75 per yard in 13 Sequin Chainette Trim Colors. 11 lengths available, from 2" to 36" long. 18" Long Silky Rayon Chainette in 37 Colors. $28.75 per yard in 34 Solid Chainette Colors. $37.75 per yard in 3 Fluorescent Chainette Colors. Trim is offered in 11 lengths, from 2" long to 36" in length. 32" Long Silky Rayon Chainette Fringe in 37 Colors. $47.75 per yard in 34 Chainette Colors. $59.75 per yard in 3 Fluorescent Chainette Colors. This trim is offered in 11 lengths, from 2" to 36" long. 15" Long Silky Rayon Chainette in 37 Colors. $25.75 per yard in 34 Solid Chainette Colors. $33.75 per yard in 3 Fluorescent Chainette Colors. This fringe is available in 11 lengths, from 2" long to 36" long. 24" Long Silky Rayon Chainette Fringe in 37 Colors. $39.75 per yard in 34 Solid Chainette Colors. $49.75 per yard in 3 Fluorescent Chainette Colors. Chainette Fringe Trim is offered in 15 lengths, from 2" long to 36" in length. 30" inches of flowing, beautiful chainette fringe, and it is available in 38 stunning colors! This high quality and beautiful silky rayon Chainette Fringe Trim is offered in 15 lengths, from 2" long to 36" in length. 36" Long Rayon Chainette Fringe. $49.75 per yard in 34 Solid Chainette Fringe Colors. $63.75 per yard in 3 Fluorescent Chainette Fringe Colors. Chainette Fringe Trim is offered in 11 lengths, from 2" long to 36" in length.